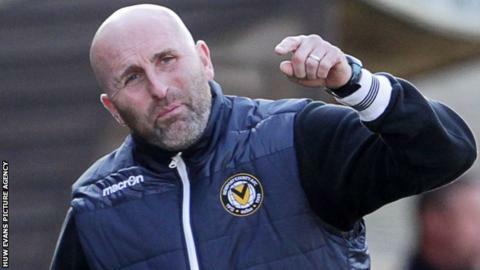 Newport County manager Jimmy Dack believes his side are "punching above their weight" to be in League Two play-off contention. The Exiles occupy the last play-off place as they lie seventh in the table. They host fourth-placed Bury at Rodney Parade on Saturday, and Dack hopes Newport can upset the odds. "We might not be one of the biggest clubs in this [promotion] shake-up but we are hopefully there to spoil the party," said Dack. "We are punching above our weight as a club. "We're in our second season in the Football League and pushing for the play-offs again which, for a club of our size, is a massive achievement." When Newport played Bury earlier this season, County striker Aaron O'Connor scored a hat-trick as the Shakers suffered their first home defeat of the campaign. Since then, however, Newport's hopes of automatic promotion have vanished while Bury are only four points behind the top three. David Flitcroft's men were recently given an "inspirational talk" from former England and Manchester United player Gary Neville at their Carrington training ground. "They've got the old Manchester United training ground, Carrington, so it just shows the difference in clubs," said Dack. "We train at a school with school kids running around and they're training at Manchester United's old training ground."